At no point does Blossom wear a hat. Joey’s name isn’t even Joey. It’s Donnie. I kind of suspect that Joey Lawrence was so dumb he was confused by being called by a different name. Look at his IMDb profile if you don’t believe me. The pilot is about Blossom’s parents not getting divorced; the rest of the show was about adjusting to their divorce. Apparently the producers/writers decided to go in a totally different direction post-pilot. A different actor (Richard Masur) played the dad, who had a different first name, Terry, and a different job, accountant. The eventual Mr. Russo, Nick, was a musician played by Ted Wass. It’s surprisingly serious. There’s a laugh-track of course, but most of the plot is no laughing matter. Blossom is so freaked out by the specter of her parents’ possible divorce that she’s afraid to get into a relationship, even one of the junior high school variety. Her older brother, Anthony (Michael Stoyanov) is recovering from drug and alcohol addiction, a situation that elicits some mild jokes (“He missed 1989”), but is treated with appropriate respect. A scene between Anthony and Blossom is the most believable one of the episode, helped by the fact that the two actors look like they could really be brother and sister. As a show that’s oft remembered for its “very special” episodes, it primed its viewers from the start for tough conversations. In the original version of the pilot, the song “My Prerogative” was used as the theme music. When they released it on DVD, they replaced it with the theme song used for the rest of the season, “In My Opinionation,” so Blossom’s dancing is out of sync with the music. At the same time the show was airing its first season, another show starring Mayim Bialik, called Malloy, was airing on Fox. It was cancelled after seven episodes. This isn’t surprising; I just didn’t remember it. The story is told as a video diary that Blossom is recording in her bedroom. We’re still seeing this storytelling technique in everything from Easy A to Super Fun Night. Blossom references crushing on both Kirk Cameron and River Phoenix. Oh, if young Blossom could see the opposite ends of the spectrum where those two landed. If you haven’t watched this in a while, I recommend checking it out, especially if you’re a fan of Mayim Bialik. For a kid who was cast in roles based on being less than conventionally pretty, she is freaking adorable. 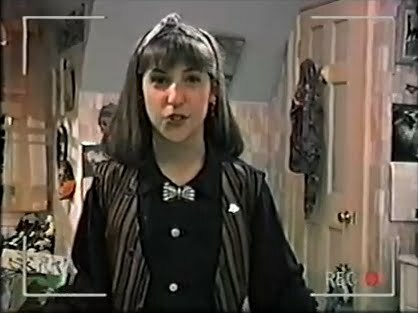 There’s a portion of the pilot where she’s wearing a little bow headband and, at first glance, it totally reminded me of Amy Farrah Flowler’s tiara on The Big Bang Theory. It’s available on DVD or Hulu Plus. This entry was posted in 1990s, Comedies and tagged a very special, Blossom, Joey Lawrence, joey says whoa, Mayim Bialik, Michael Stoyanov, Richard Masur, sit-com, Ted Wass, The Big Bang Theory, The Howard Stern Show by meekthegeek. Bookmark the permalink.